From architectural icons, to transcendental cultural landscapes, California is rife with places worth celebrating. The California Preservation Foundation’s mandate not only focuses on educating and advocating for the protection of these places. We also have celebrated the places that matter most to Californians, from its monumental works of architecture and engineering, to the diminutive-yet stunning roadside vernacular architecture of places like Route 66. Since 1976, we have held an annual statewide conference where preservationists can gather, exchange ideas, network and organize around important issues. The 2019 conference will be held in Palm Springs, a city known for stunning architecture and breathtaking landscapes. The conference features cutting edge presentations, tours of the region’s most historic sites, and multiple receptions where you can catch up with old friends and meet new ones. More information is available on our conference page here. The Preservation Design Awards honor the accomplishments of architects, engineers, developers, preservation consultants, non-profit organizations, government agencies, and others for outstanding examples of preservation, restoration, rehabilitation, reconstruction, contextual infill, sustainability, cultural resource studies and reports, craftsmanship and preservation technology, and archaeology and interpretive exhibits. The 2018 Preservation Design Awards ceremony will take place on October 19th at the Millennium Biltmore Hotel in Los Angeles, California. Tickets and sponsorship opportunities are available here. CPF has educated preservationists on a vast array of historic preservation topics, through our leading on-site and online professional training programs. We equip advocates statewide – and across the country – with the tools they need to protect the places that matter to them. More information is available using the links below. 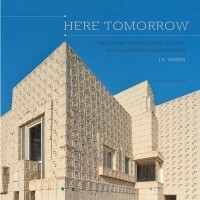 Here Tomorrow, a stunning 250-page tome of the state’s most beautiful preservation achievements takes its inspiration from our three-decade old Preservation Design Awards, which celebrate the best in historic preservation. This section of our website contains stories and narratives that celebrate the complexity and beauty of California’s historic places. We hope you enjoy these stories, and encourage you to purchase Here Tomorrow to share in the celebration of California’s multilayered and multicultural history.